Within start-up incubators and accelerators across the world, aspirations are constantly high. Internet start-ups always begin tiny, but come armed with future plans of global success. For many, an international presence is only a few years along on the roadmap. Incredibly, this is often a plausible target: the likes of Airbnb and Uber have proven as much, and have given entrepreneurs solid justification for dreaming big. Never before have opportunities to grow a global business from nothing seemed so plentiful. The goal for most of these start-ups is the pursuit of an economy of scale; growing the business to a point where it is so large it can offer products or services at a rate that simply cannot be matched by smaller competitors. The 21st century has been defined by the opportunities and possibilities opened up by technology, particularly the internet, producing businesses capable of growing swiftly to sizes that would have been impossible in the past. While this new rate of growth has created unique challenges, the rewards for successfully overcoming these barriers are too great to ignore. The opportunity for a start-up to take on the world has changed the way companies are formed. Developing an economy of scale is one of the oldest business models, and first truly came to prominence during the Industrial Revolution. At its simplest, an economy of scale describes the cost advantage that comes with producing a large number of products as opposed to producing a smaller number. As an example, producing a single hat from scratch is an expensive endeavour. While the raw materials and labour needed for making the hat may be the same for every hat, the work needed to design and purchase specialist equipment needed to produce it is the same no matter how many are produced. Based on this, making 10,000 hats works out to be a considerably less expensive endeavour per hat than producing just one, reducing the price each individual item can be sold at. This model can be applied to any industry that works in mass production of goods or services. Throughout history, the ability to achieve a greater economy of scale has been fundamentally linked to advances in technology. As machinery allowed for greater levels of productivity, the cost of many products and services has been pushed further and further down. Ships became able to carry much more cargo with few additional costs, and the development of processes like production lines simply meant more could be done with a day’s work. This all contributed to the evolution of big, global businesses capable of producing massive product volumes with small overheads. In recent history, this pursuit of an economy of scale has come to define and differentiate the modern internet start-up company from competitors of the past. The likes of Airbnb and Uber do not offer any sort of remarkable new service – taxis and hotels are not revolutionary ideas – but it’s the size they operate at that has set them apart. Others have sought out an economy of scope, where a business keeps costs low by doing a huge variety of different things. It’s this model that has pushed Amazon to its current heights, with the company now operating in everything from supermarkets to software design. It is trends like these that most start-up founders are keen to emulate. Matt Kuppers is the CEO and founder of Startup Manufactory, a start-up consulting business that works with entrepreneurs to fine tune their business models. For start-ups, scalability comes in a number of different forms. While many seek vertical scalability and dominance in a particular market, Kuppers said that many also pursue horizontal scalability. This might encompass the ability for the business to push into another country or market with the same product or service, for example. While many businesses have worked to achieve this model and operate on a truly global level, what is remarkable about this current period in history is how quickly start-ups have achieved the size that they have. Uber was only founded in 2009, and Airbnb in 2008, but they are now valued at $68bn and $31bn respectively. Other ‘unicorns’ (start-ups valued at over $1bn) include Spotify, Stripe, Dropbox and WeWork, none of which are more than 11 years old. With the internet’s global reach, added to the fact that a computer program can be built once and then multiplied for free, companies have designed and developed business models that work on a scope that was impossible for previous generations. “If you have a business that has a wide range or a high reach in terms of customers, it’s just the nature of the model that it’s scalable,” Kuppers explained. Creating and updating an app is an extremely small expense when compared to maintaining a fleet of taxis or hotels, since an app only needs to be built once and then can be duplicated for effectively nothing. With a large enough user base, individuals only need to be charged a tiny amount by a company to recuperate costs. This has lead to start-ups targeting a global scale for their operations, given the ease of expansion. This has been the biggest change that the internet has prompted; businesses that can reach a global scale without much of a change to their business model. There is no real fundamental difference between a smartphone in China and the US, meaning any internet start-up can quickly move their app from one country to another. The ease of reaching new customers has made global expansion relatively simple, and economies of scale never thought possible are now within reach of any ambitious business. Despite this new ease of doing business prompting the meteoric rise of many start-ups, a host of barriers to growth still exist. While certainly easier than it was a few decades ago, Kuppers noted that the path to a global economy of scale is not straightforward. One major challenge is contending with differing regulatory requirements. A particular category of internet start-ups plagued by regulatory challenges in the US are daily fantasy sports leagues. DraftKings and FanDuel were founded in 2009 and 2012 respectively, and allow players to win money from daily pots based on their fantasy American football teams. Since launching, both have waged a lengthy state-by-state battle with regulators to be considered games of skill, in order to avoid gambling regulations. As of July 2017, 14 US states allow them to operate, according to ESPN, though the rest are still in a state of limbo. Other start-ups have taken a more nuanced approach with regulators, seeking forgiveness rather than permission. Uber’s battles with regulators still dominate headlines, ranging from being completely kicked out of cities, to protests from frustrated taxi drivers. In some cases, the legality of entire technologies is in question; driverless cars seem close to reality, but debate still rages as to what standards they should meet. These roadblocks present a significant challenge for businesses that are designed to only work at a large scale. Many internet start-ups, particularly ones that have not gone public, operate on a model where profitability is an end goal, achievable only once a certain scale has been reached. A prime example of this is Spotify, which has posted mounting losses even though it is adding customers in droves. The company’s user numbers are likely a key point in negotiating royalty payments to record labels. While this year it has been able to draft up more favourable deals with labels, continuing to acquire new paying users is the key to its future success. Twitter and Snapchat are in similar positions, where consistently adding users is the only way to both plan for the future and grow advertising profits to a sustainable level. Kuppers added that, in some cases, this could be a positive for start-ups. This pressure to grow, combined with the capital needed to support it, can push businesses to achieve things they would not have been capable of on their own. However, the added pressure can also be extremely damaging to a business. There is perhaps no better example of the damage growth targets can do to a company than Uber. At the beginning of this year, former employee Susan Fowler posted a scathing blog accusing the company of tolerating outrageously sexist behaviour from employees simply because the culprits were meeting their targets. By putting growth and success at the centre of the company, ahead of employee wellbeing, Uber’s culture deteriorated to a level that ultimately cost CEO Travis Kalanick his job. Responding to the crisis, board member Arianna Huffington declared the company would no longer hire “brilliant jerks”. There is also a natural upper limit to how big companies can get. The inverse of economies of scale are diseconomies of scale, and these occur when a business becomes so large or unwieldy that cost and productivity gains are no longer seen. The challenge for internet start-ups, then, is to avoid becoming the very companies they set out to overthrow – out-of-touch behemoths that are too slow to adapt. While start-ups today seem capable of growing at an incredible rate, the start-ups of tomorrow will be posting even more ridiculous numbers. Right now, the world of business seems to be on the brink of another huge advance in technology. 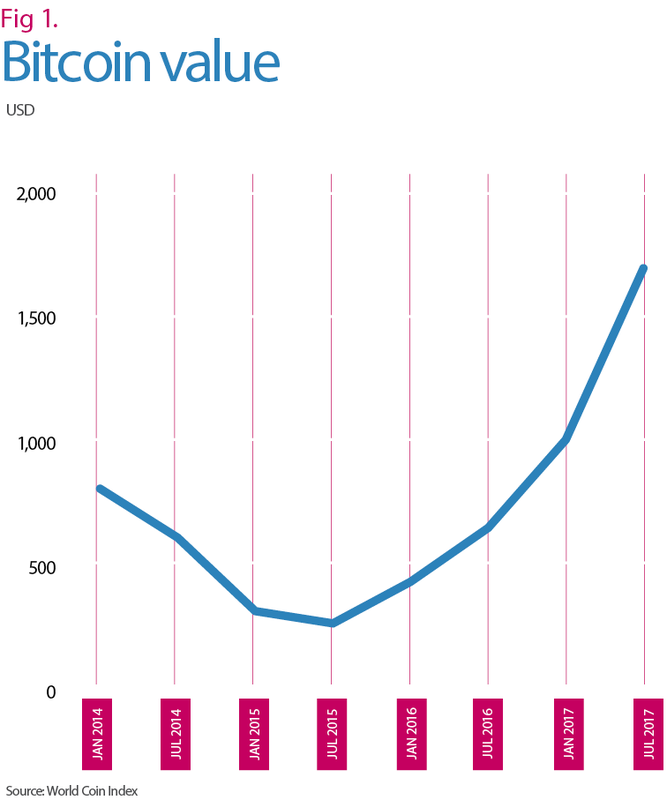 This has been a grandstand year for cryptocurrencies (see Fig 1); on April 1 2017, their global market capitalisation was slightly over $25bn. In June, it surpassed $100bn and has since showed no sign of slowing down. Initial coin offerings are capable of a level of growth most businesses could only dream of. Effectively, blockchain technology is doing the same thing as Uber and Airbnb, taking advantage of easier communication to reach a greater economy of scale than the industry it is seeking to disrupt. While blockchain has been a boon for cryptocurrencies, the system has a wealth of other potential applications. As a process for storing and sharing information, blockchain has the potential to break down the same communication barriers that the internet did. This surge in interest has naturally resulted in a wealth of challenges for businesses operating in the space. US-based cryptocurrency trading platform Kraken is just one of many to suffer from intermittent services this year under the huge volume of transactions it processes. On May 5, the company’s record for volume traded in a single day was broken after posting over $178m in trades, beating the previous record set in March by 25 percent. “That’s an economy of scale where you can see people pouring into the market and the marketplace can’t handle it anymore,” Kuppers explained. Other cryptocurrency businesses dealing with this scale, like Singapore’s TenX, have taken a more muted approach. Despite raising around $80m in a token sale, the company has indicated it only plans to grow its staff at a gradual pace. While there has been tremendous short-term growth and interest, cryptocurrencies still have a long way to go before they prove their long-term feasibility. Still, the incredible growth they have shown in such a short amount of time raises the prospect of internet start-ups of the future being capable of even more impressive and rapid expansion. As the world has become more interconnected through new technologies, businesses have found new channels for growth and capabilities to operate on a global scale overnight. While it comes with challenges that have not been faced before, this model will not be replaced anytime soon.